In case if you are facing a similar issue and wondering how to fix windows 10 calculator not working error. Then not to worry, we are here to help you out. In this article, we will talk about the top steps that you can follow to fix the calculator not working on Windows 10 problem easily. So, let’s dive just dive right into the topic. How To Fix Windows 10 Calculator Not Working Error? 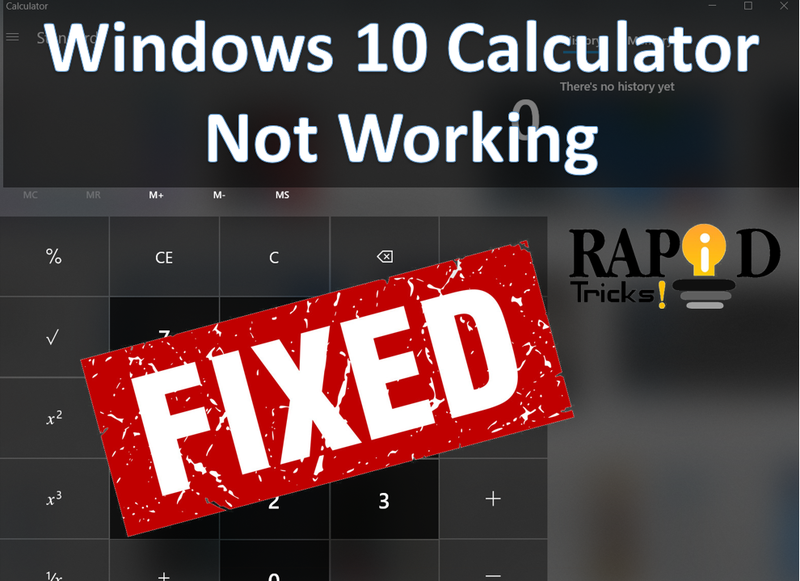 So here we will talk about the 3 working methods to fix windows 10 calculator not working error. So let’s get started without wasting much time. The first thing that we can try is reinstalling calculator. There might be a high chance that the Calculator program has been corrupted for some reasons. And reinstalling it might fix the issue. But hey, you might tell me that it is not possible to uninstall a Windows program. Well if you have the similar thought then you are kind of wrong here. Yes, most of the time it is quite impossible to uninstall a system file. But there are some possible chances. Step 1: First of all click on the Start menu and type in PowerShell. Step 3: Over here you have to type down this following code, or you can copy and paste the code given below. Once you paste the code, hit the Enter button. This will uninstall the Windows Calculator. Step 4: After that, we have to reinstall the Calculator app again. For this, we will use Windows PowerShell. Paste the code given below in Powershell. Then hit the Enter button, and you are all done. Just in case if you are not comfortable with PowerShell, then you can also use Windows Store to download and install the Calculator. However, it does not support the uninstall feature. There is also a high chance that your Account does not have the requirements to use the calculator. These requirements are often set by UAC or User Account Control. So if you create a new account, then there is a possible chance that you will be able to get rid of the Windows 10 calculator not working problem. Step 1: First of all you have to log in to an administrator account if you have not already. Step 2: After that, you have to go to the start menu and type Settings and then click on Accounts. Step 3: From here you have to go to the option that says “Family and other users.” You can find the option on the left side of the window. Step 6: From the new Window, you have to click on the “Add a user without Microsoft” option. Step 7: Over here you have to enter all the required details including a username and password and save them. Step 8: Then you have to navigate to Settings > Accounts > Your Account. Step 9: Over here you will find your Account picture and below that you will find the “Sign in with a local account instead” option, just click on it. Step 10: Then enter your account password. Step 12: Once you are done with all the process, you will easily be able to switch from new to the local account. Also, you will be able to move your personal files to the new account without any issues. Step 13: In the end, simply navigate to Settings > Accounts > Your Account and select the option “Sign in with a Microsoft Account instead.” Then enter your username and password and click Sign in. After that check, if you are still getting the Windows 10 calculator not working problem or not. If it has fixed the issue, then simply delete the old account and start using the new account. Step 1: First of all you have to log in to the Administrator account. Step 2: Then from the Start menu and type down CMD and run it as an administrator. Step 3: Once command prompt gets opened, type down net user Administrator /active: yes and hit the enter button. Step 4: Then from the start menu click on your profile icon and navigate to the Local disk C.
Step 6: Then right click on it and go to the Properties and grant full access to your account. Step 7: After that, you have to switch back to your account navigate to the Drive C > Program Files > WindowsApps. Step 8: Over here you have to look for the “WindowsCalculator” folders. Also, you have to right click on each of the folders and go to properties and then change the ownership from SYSTEM to your user account. Step 10: In the end delete all the “WindowsCalculator” folders and install Calculator back from the Windows store.